It’s a beautiful summer day and the backyard party was a huge hit. But now it’s lunch time and everyone’s stomachs are starting to growl. The best flat top grill/griddle can handle cooking for a huge group without breaking a sweat. Backyard grilling has been a part of the American vernacular for a long time. It’s hard to find a home in North America that doesn’t have a charcoal grill, natural gas grill, or propane grill sitting outside! However, this summer, there is clearly a new challenge to traditional grills for the hearts, minds, and meats of outdoor BBQ enthusiasts: the flat top grill. The flat top grill – or outdoor griddle – is not a fancy piece of equipment, but rather a metal flat top cooking surface set atop some burners. Designed to cook all types of food for a large group of people fast with the least hassle, this type of cooking was originally only available commercially to short order cooks. Nowadays, flat top grills are available to consumers almost everywhere. They have become a canvas to culinary artists of a new breed. The best flat top grill can be hard to find. Whether you’re looking for a flat top grill to assist you in feeding the family or cooking for a crowd, this article is designed to help you find the one that’ll best fit with your needs and within your budget. Product Weight	 120 lb. 144 lb. 103 lb. 32 lb. 75 lb. 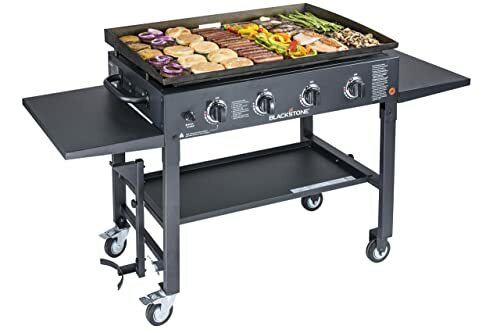 There is no doubt the Blackstone 36 inch Griddle Cooking Station is the best flat top grill for most people. As one of the most popular outdoor griddles available, this grill gets so many great reviews from both owners and outdoor grilling enthusiasts. 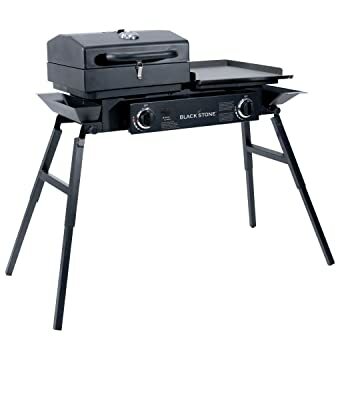 And the reason why so many people love it – this flat top grill griddle is versatile, easy clean up, easy adjusting temperatures, distributes even heating, cooks fast, has a quality that will last for over a century, and most importantly, it’s one of the more affordable flat top grills on the market. The Blackstone 36 inch Griddle gives a lot of choices and customization. It gives you a lot of options which can make your food scrumptious and good looking. As you can estimate the size of this flat top grill, it is pretty spacious. It can cook the right amount of food at a time which makes parties easier. The top of the grill is not only spacious but is designed to avoid grease and extra oil. With this attribute, the food cooked is exquisite with less oily. The Blackstone has 4 independent heat controls and a scorching 60,000 BTUs (15,000 BTUs per burner). 720 sq. inch griddle cooking surface made of cold rolled steel – which is very similar to cast iron – for excellent heat retention and distribution with a sturdy, powder coated steel frame. This flat top grill and griddle can serve an entire crowd with full-sear steaks, flip up to 28 burgers or 72 hot dogs! Other features include electric ignition, stainless steel burners, built in grease catcher, 4 heavy duty casters (two are lockable), 2 cantilevered shelves, folding legs. The unit does come with a propane tank holder that easily keeps the tank off of the ground in a convenient location. 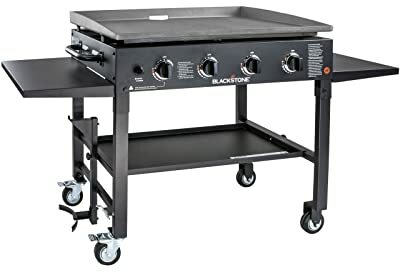 Overall, for its affordable price, spacious cooking surface and solid construction, the Blackstone 36 inch Griddle Cooking Station is our pick as the best outdoor griddle/best flat top grill money can buy. Everything we have cooked on it turns out great. Pancakes are a breeze. Breakfast eggs and bacon with hash browns and even buttered toast are phenomenal. Chicken with fried rice, zucchini and squash are just like done at a Japanese restaurant. Even steaks can be seared to perfection. 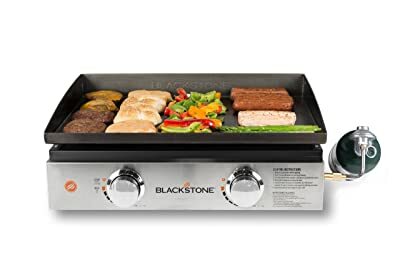 If you’re looking for a stainless steel flat top grill, then the Blackstone 36in Stainless Steel Griddle is the best choice. 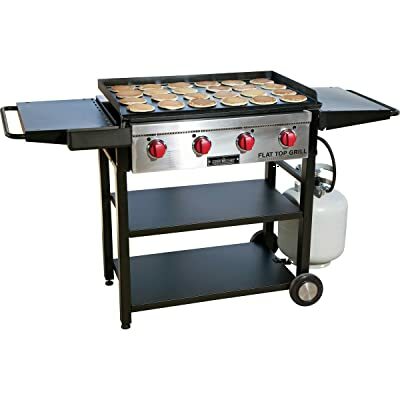 Cook up a mess of pancakes or a bunch of burgers with the versatile FTG600 Flat Top Griddle and Grill from Camp Chef, one of the more popular outdoor griddle makers. This heavy-duty steel griddle is packed with convenient features. Constructed of pre-seasoned, heavy-duty steel, the 600 sq.ft. cooking surface of this Professional Steel Griddle is ready to use right out of the box. 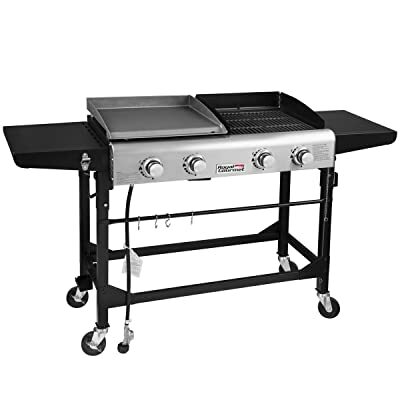 Not only one of the best flat top grills available, but it also one of the top rated. Although the Blackstone is a bit larger (720 sq.ft and 600 sq.ft.) and has a better price, we still prefer this Camp chef flat top grill. The thing we like the Camp chef griddle more than the Blackstone griddle is the fact that it can be used as a griddle or a regular propane grill. Remove the griddle top and you’ll find a massive grill underneath. This interchangeable feature is excellent that allows us to make hamburgers, chicken, and steaks. Another feature that we really like in the Camp Chef Griddle is its reliable ignition system. Like the ignition system in Weber’s gas grills, the ignition system of Camp Chef Griddle is very easy to use and quite cost-effective over time. It did ignite almost every time we turned the knobs with no effort. This powerful ignition system is superior to any other flat top grill ignition system we’ve ever seen. 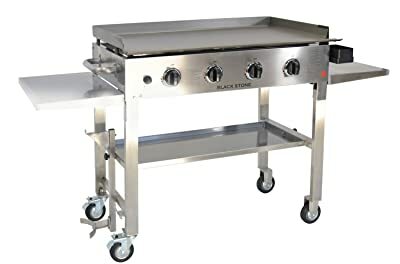 The unit features four stainless steel burners provide 48,000 BTUs of power, non stick surface, 2 large folding side shelves, grease management system, grease tray, catch bucket, and micro adjust griddle levelers, propane tank holder, heavy-duty carry handle. Unfortunately, the larger version Camp Chef 6-Burner Flat Top Grill 900 does not have an interchangeable grill/griddle. The Royal Gourmet Grill and Griddle Combo features dual cooking surface with grill and versatile flat griddle interchangeably. Both offering a 292 Sq. In. cooking surface for a total of 584 total inches of cooking space. 4 stainless steel burners, allow you to set 4 different cooking zones, putout 48,000 BTU output. Heavy-duty full stainless-steel control panel and double-layer lid enhances its luxurious appearance, rust-resistant and makes cleaning simpler. Large metal side shelf offers additional workspace and is convenient for placing various seasonings. The 360-degree locking casters allow for easy transport. If you’re looking for a truly portable flat top grill for your camping trips, the Blackstone 22 Inch Tabletop Griddle is a perfect choice. This griddle is compact and convenient. Weighing in at just 32 lb and being powered by a 1 lb. propane bottle, this is ideal to use in any car camping trip or RV boondocking. You can also use the optional bulk tank adapter hose to connect this portable griddle to a 20 pounds propane tank. This is the best portable flat top grill, in our opinion. We love everything about it especially the fact it’s small but yet you can cook a lot of food at one time. At 330 sq. in. of griddle cooking surface, this small griddle is ideal for cooking burgers, hot dogs, steaks, stir fry, sautéing mushrooms and onions, bacon, eggs, hash browns, pancakes, and so much more. It gives you 2 independent cooking zones, with 2 independent knobs with built-in igniters. The 2 in. H style burners provide even heat distribution for optimal cooking across the whole griddle. For those who are hesitant to trade their grills in for griddles, the Blackstone Tailgater has a griddle on one side and a grill box on the other giving you the best of both worlds. This flat top grill combo has a dual cooking surface with two independent burners that give you the ability to cook different styles at the same time. The left side cast iron burner allows for intense heat, best used for stockpots, cast iron pans, dutch ovens. The right side stainless steel tube burner offers even, widespread heat, best used for griddle cooking. The Tailgater offers 477 sq. inch total cooking surface, including a multi-purpose grill and griddle plate. This cooking surface is enough to cook 9/9 hamburgers, 4/4 steaks, 20/20 hotdogs. The grill has adjustable legs; means you can cook on any terrain and stay level. The legs are easily folded to take up as little space as possible when not in use. The Blackstone Tailgater is one of the best flat top grills and griddles for any outdoor event, especially for the tailgate party. It’s versatile, easy to set up, almost no assembly required, ready to use in seconds. Imagine a massive backyard party. All the kids of the block, relatives from across the country, neighbors, coworkers, and even pets! That’s a lot of mouths to feed – you’d probably have to work full-time cooking while people have the time of their lives. Griddles or flat top grills are ideal when cooking for a crowd as they have a large surface area. The fact that there are no sides (as with a skillet) makes it easier to flip food, and the open area doesn’t trap any moisture so the food—for example, hash browns—becomes nice and crispy. Commercial restaurants frequently use flat top grills in their operations for large amounts of food as well as to keep food warm. These flat top grills can be very large and be able to cook food for one up to 200 people. The possibilities are limitless when it comes to what you can cook on a flat top grill. A flat top grill can be used for making breakfast foods like pancakes, French toast, or bacon. It can also be used for making some burgers, hot dogs, or some wraps, like fajitas, quesadillas or tacos. And it doesn’t stop there –the flat top grill can achieve the blazing-hot temperatures needed to cook fried rice, vegetables, chicken, seafood, and beef just as well as a wok. On a flat top grill, the choices for breakfast, lunch, or dinner are infinite. The best flat top grills are built to last a lifetime. Since the flat top grill is one solid piece of steel, the grease doesn’t come in contact with the fire and the burners. So the burners can last a decade before needing to be replaced. You can turn one or more burners off while cooking with a flat top grill. This is ideal when you’re cooking several elements that you will bring together to form a meal. Once your onions are perfectly cooked, you can turn off the burner to the far side and slide the onions over to that zone. Your onions will stay warm but will not continue to cook or burn. The same theory applies as you stack up pancakes on one end of the flat top grill as your sausage links continue cooking on the opposite end. Flat top grills and griddles work through conductive heat. Conductive heat is a very efficient means of energy transfer, especially when you cook on a metal surface. Transfer energy through a metal surface creates delicious crustification for food, and the more metal you have, the better. Another reason is flat top grills tend not to be too expensive. You can get the best flat top grills available for under 350 bucks. Step 1. Let the griddle cool down after cooking. We don’t want any burned hands! After you’re done with the cleaning. Don’t forget to season your griddle. Seasoning your flat top grill griddle is important because it allows the cooking surface to develop a hardened, often nonstick coating that will allow foods to release much more easily from the grill. Some flat top grills require seasoning prior to cooking, and others come pre-seasoned from the factory. Here are a few simple steps we have found helpful when seasoning or re-seasoning a grill griddle surface. Step 1. Heat griddle to 350 degrees Fahrenheit for 30 minutes. Then, turn it off and let it cool down. Step 2. Apply vegetable oil or any oil with a high smoking point. Step 3. Avoid corn oil as the high sugar content may cause the oil to caramelize and burn on the surface. Step 4. While surface is slightly warm, spread oil using a cloth or paper towel. Step 5. Turn heat back on to 350°F. Step 6. Heat until oil on the griddle begins to smoke. Then, turn off and allow to cool. As a rule of thumb, all you have to do is rub the surface with oil. Then store it somewhere that’s cool and dry. This final layer of oil protects the flat top from rust. When you’re not using your flat top grill, be sure and keep it covered. The durable, weather resistant cover will protect your flat top grill from the elements.